On July 8, 1947, a group of visitors were picnicking at the Pennsylvania Monument when they witnessed half a dozen silver objects fly over the battlefield and disappear in the east, not once but twice. Aghast at the site of these unknown objects slicing across the sky, the couples reported their experience that would be logged up as one of numerous suspicious sightings of “flying saucers” throughout the country that year, described as everything from saw blades to round, silver disks that made little or no noise as they whirled across the sky. Little did this group know at the time how this odd observation was only one incident of the tantalizing craze that would not only grip Adams County, but the nation as a whole-earth was being invaded. Was Gettysburg on the intergalactic list of places to visit? Not since 1938, when Orson Welles’ infamous “War of the Worlds” broadcast gripped many Americans in fear of alien invaders, had America thought for one moment about the threat from beyond the cosmos. But here it was, flying over the Pennsylvania Monument in the broad daylight of a sunny July afternoon. The post-World War II era saw an explosion of strange sightings, reports of flying saucers, and other bizarre events seemingly beyond reasonable explanation. It was the new science fiction, which extended itself beyond radio broadcasts and books to movie screens all across the country. 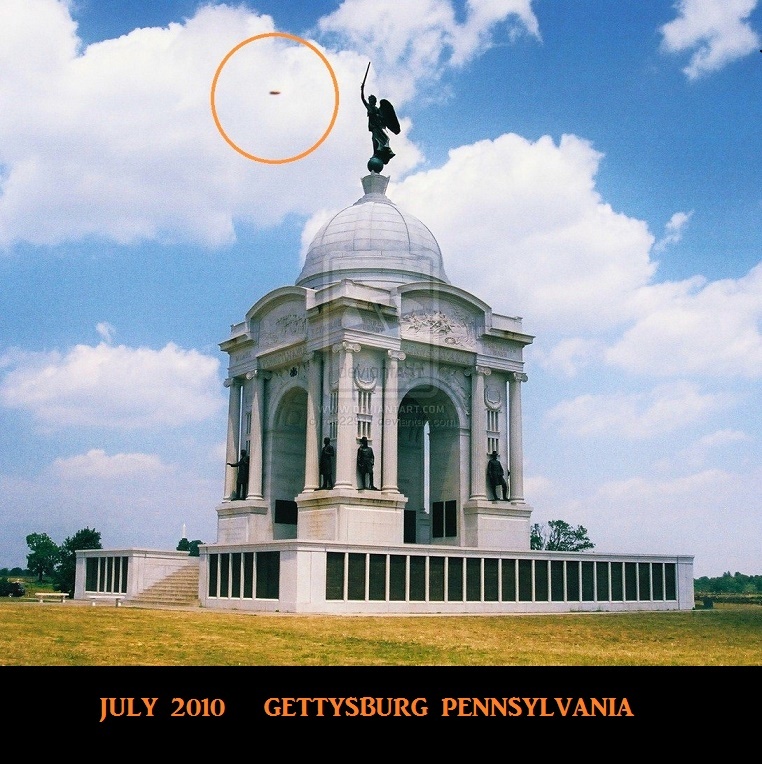 There was something flying around up there and though no one had any idea of what it may be; “it” had finally made an appearance over Gettysburg National Military Park. There never was a full explanation or official disclosure about the 1947 sighting over the park. It was simply chalked up as one of the numerous sightings of unidentified flying objects that flourished around the country over the ensuing decades and certainly those picnickers who were enjoying their afternoon in the park on that day in 1947 had no idea they would part of the national sensation of observing “Flying Saucers” and quite possibly the beginning of an alien invasion! And barely four years later, Hollywood would produce the epic film, The Day The Earth Stood Still (1951) where a flying saucer landed on the national mall in Washington, DC. Isn’t it unfortunate the script writers did not see this story in the Gettysburg Times first and have Klaatu’s ship land on the lawn beside the Pennsylvania Monument? That’s probably for the best given the nation’s capital was a more pertinent choice in those early years of the Cold War. Park employees will sometimes be questioned as to the existence of ghosts or spirits on the battlefield, but few have ever asked if any of us have seen or witnessed UFO’s coursing across the park sky. Hopefully the interest in that phenomenon faded a long time ago, along with drive-in movies and bell bottom jeans. NOTE: Actually…the sighting took place the day before (on July 7, 1947 around 3:30 PM). In fact, there was a huge wave of UFO sightings nationwide in 1947…including Pennsylvania, in which 25+ individual reports were made on July 7th & 8th. As well, the Roswell Incident was reported on July 8, 1947. Over the years, there have been UFO sightings around the battlefield, including a witness account I received in 1996 of a small disc landing on top of Devil’s Den. I never did get a confirmation on that one, but the Park Ranger I talked to didn’t think it was worth noting or repeating. I guess he wasn’t looking forward to any future alien questions from the tourists. 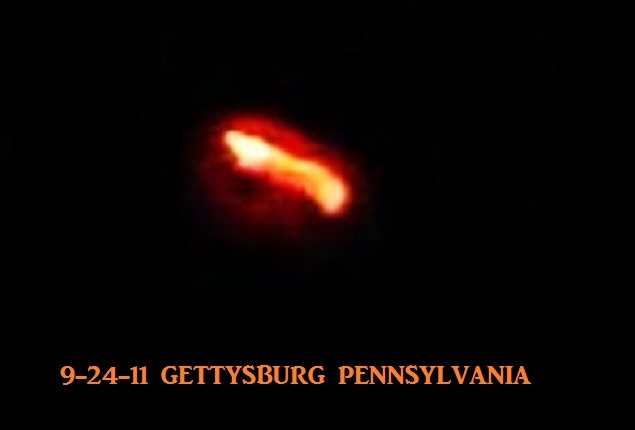 This entry was posted in ABDUCTION, best ufo photos, incredible ufo photos, MISSING TIME, top ufo news, UFO, UFO ARTICLES, ufo news, ufo photos and tagged 1947 GETTYSBURG UFO, 7-8-47 GETTYSBUTG PENNSYLVANIA UFO, ABDUCTION, ALIEN CRAFT, animal abduction, army ufo, best ufo images, best ufo photos, best ufo pictures, best web site world ufo photos, biggest ufo web site, boomerang craft, chief investigator, CIGAR, civilian panic, commercial pilot ufo, COSMOMAUTS ALIEN ENCOUNTER, crashed disc, CYLINDER, cylindrical craft, diamond ufo, DISC, disclosure, discoveries on mars, discoveries on moon, FLYING SAUCER, GETTYSBURG BATTLE FIELDS UFO, government black ops, I.S.S. UFO, incredible ufo photos, international space station and ufo alien craft, JULY 8, JULY 8 1947 ROSWELL GETTYSBURG UFO, KEN PFEIFER, ken Pfeifer discoveries, Ken Pfeifer State Director for MUFON in Rhode Island, Ken Pfeifer State Director for MUFON in Vermont, largest ufo photo website, largest ufo web site, largest ufo web site in the world, LIGHT, LIGHTS, marine ufo, MARS, mars discoveries, mars photos, MEN IN BLACK, MISSING TIME, MOON, moon discoveries, moon photos, MUFON, national press club ufo, navy ufo, no disclosure, ORB, ORBS, pfeifer, pyramid ufo, radio ken Pfeifer, rectangle ufo, RUSSIAN UFO, Saturn discoveries, saucer, secret society, SPACE ENCOUNTER, State Director Ken Pfeifer for MUFON in New Jersey, STRANGE, sun photos, swamp gas, top ufo news, TRIANGLE, ufo, UFO ARTICLES, ufo crash, ufo news, ufo photos | Tagged air force ufo, unidentified submerged object, unidentified submerged objects, uso, world largest ufo web site, world ufo photos and news, world ufo photos is the largest UFO photo website in the world by KEN PFEIFER. Bookmark the permalink.